The Spitfire IX was probably the most built/rebuilt of the series and was used from around 1942 until the end of the war and even later. Many of the units formed with pilots from German occupied Europe were allowed to take their planes home to help form part of their own air defenses. The pilots of Czechoslovakia were amongst those who did so, using the Spit IX to get their own air force back into operation. When the aircraft were no longer needed or there were surpluses, they were sold off. Many went to Israel in 1948, helping to give that new nation an air force with which they could keep their independence, something the Czech people were unable to do regarding the Soviets. CMR has gained quite a reputation in the last years for producing quality resin kits. My first introduction to them was with the Hughes H-1 racer of a few months back. This time, it is the Spitfire IXE that has the spotlight. Molded in a light tan resin with very nicely done engraved panel lines and other detail, the kit is packaged in several segmented poly bags, which are themselves in another bag to prevent any damage during shipment. There is also an instruction sheet and several pages of very nicely done black and white photos taken at the Czech Aviation Museum of the Spitfire on display there. Besides some nice detail and interior shots, there is a drawing of the seat assembly. The resin itself is free from any molding glitches that I could see. The only damage I had was to the complete prop as one of the blades had broken off. This had apparently happened before putting the part in the bag as it was not in there, even prior to my opening the seal. Fortunately, you get another prop with separate blades so repair should be easy. Some of the parts are incredibly fine and quite scale in thickness, making one a bit apprehensive about using them! There are a myriad of optional bits including two wings, two sets of rudder pedals, three wheels with four insert options, two rudders, three choices of cannon, two gun sights, two mirrors, and the choice of a long range fuel tank, centerline bomb, wing bombs or drop tanks. Also shown in the instructions is an alternate set of one-piece exhaust, but this was not found in my kit. I should also mention that the elevators are the later variety as used on most Spit IXs. The kit also includes a set of canopy/wheel masks (for all three sets of resin wheels), two superbly done vac canopies (though I've not seen one with a brace through the center of the rear clear part), and an excellent set of Eduard color photo-etch. Much of this is for the interior, but it also includes some exterior bits, including the main gear doors. Instructions are superbly drawn with all the optional bits shown and where it applies, it details which of the camo schemes the parts are specific for. Color information is provided as generic and FS 595 so you can pick the brand of paint that you wish. There are markings for no fewer than 12 different aircraft. 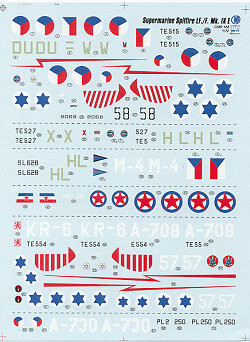 The majority of the markings options are for Czech aircraft and you get a goodly variety of styles from different periods in the late 1940s. 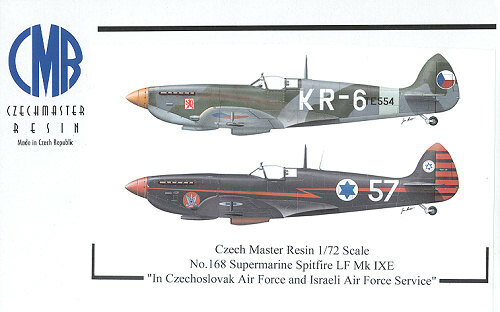 Most of these are in the standard RAF scheme with variations for the removal of British markings and the application of Czech ones. There are three Israeli planes; two black and one unpainted metal. One Yugoslav aircraft is a plane on its way to Israel that was grabbed by the Yugoslav authorities. Decals are simply superb. They appear quite thin and I found no problems at all with registration. There is a separate stencil sheet containing enough for two planes. A separate stencil placement guide is provided. Now there are probably some of you who are thinking that I'm just sucking up to the manufacturer and I'm not going to change your mind. 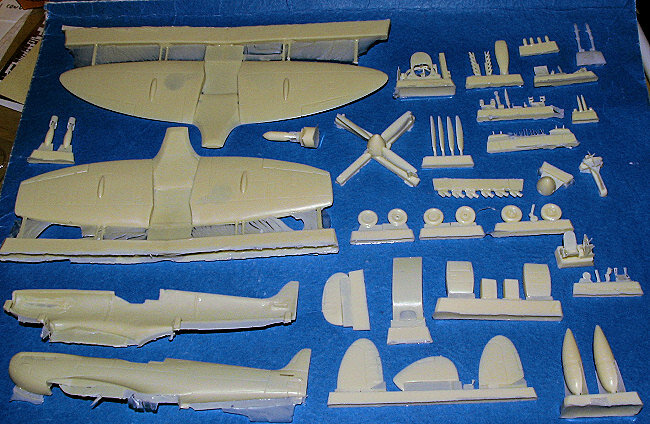 To the rest of you, I have to tell you that this is the most complete and detailed 1/72 Spitfire kit I've ever seen. 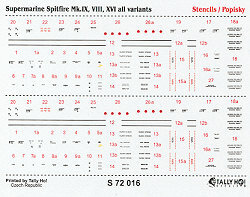 The level of detail is superlative and even if you don't want to use the kit markings, if you are looking for the best late war Spit IX around, this is it.